Tax Freedom Day – the date on which Americans will have worked long enough to have earned enough money to pay this year’s tax obligations at the federal, state and local levels – falls on April 1, 2010 for residents of New Mexico and Tennessee. The date for all Americans will be Friday, April 9, 2010. 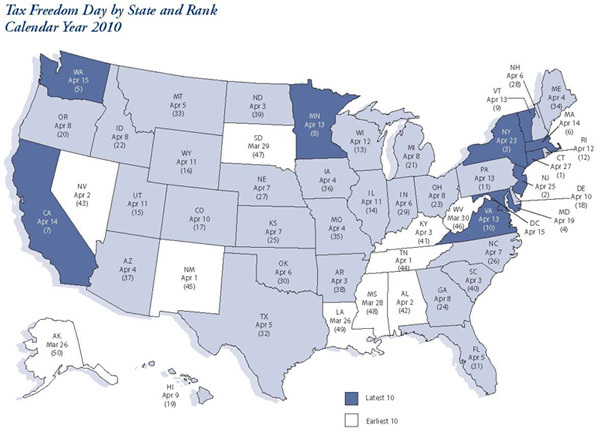 Residents of both New Mexico (45th) and Tennessee (44th) had to work 91 days into the year in order to earn enough money to pay their combined federal, state and local taxes, 8 days shorter than the national average of 99 days.